This was another commission for my brother-in-law's motorcycle following the nicely successive toolbox earlier this summer. 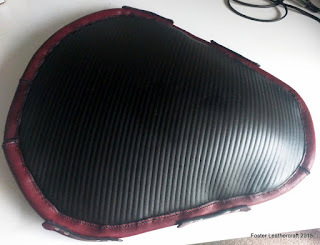 The idea was to add some padding to his motorcycle's seat and eventually we figured the best plan was to wrap some foam in leather and cinch it down using velcro straps. He supplied the foam (which I gather began as a yoga mat) and I coerced some latigo into a housing. That was particularly tedious since I was stitching through the foam itself. Without access to all sides of the seam I had to find the underside of the holes by touch alone. So the inner seam (which holds the top to the walls) took me about a day and a half. The outer seam (through the lid, foam, and the bottom of the walls) took 8 days to finish. 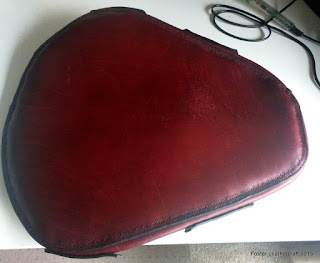 Since it was a longer-term project I endulged in some Netflix whilst doing most of the stitching so put another way it took 4 action movies, the entire first season of Gothlam, and the first third of "Boneshaker" (a steampunk audiobook) to finish all that stitching. 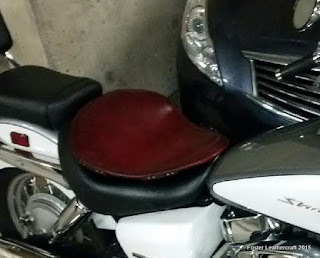 I haven't heard back for how the seat rides just yet but it looks like it fits pretty swell.